Urban redevelopment was an opportunity to adopt solutions and achieve different targets through nature-based solutions. Carta of Milan, the city's strategic environmental plan, recognises ‘green infrastructure’ as the best way to achieve environmental targets, promote social development and improve social welfare. On a wider scale, the Lombardy Region manages the green infrastructure actions for ecological connections and the creation of ecosystems, ensuring continuity between the Alps and the Po Valley (Pianura Padana) and the urban environments within that area, ensured by the Rete Ecologica Regionale Plan. The plan provides guidelines to the different municipalities for the management and creation of ecosystems and outlines the funding mechanisms. Gorla Maggiore, about 30 kilometres northwest of Milan, lies in a delicate transition zone. The town and its waterpark help to improve the quality of the area's water and to better regulate the flow of water. The city of Milan implements different nature-based solutions as part of its architectural and urban renewal strategies. Bosco Verticale (Vertical Forest) by Stefano Boeri is a showcase of advanced engineering and technological development which uses nature-based solutions as an example of sustainable urbanisation. Urban Gardening plays an important role in the city of involving people in the management of urban green spaces. Green urban areas, in particular public parks, gardens and urban forests, are created for multiple purposes. Green urban areas provide Milan with important ecosystem services while Green Rays and Green Belts are meant to connect the green areas using pedestrian/cycling green roads. Parco Agricolo Sud, a key area of the Green Belt, offers an example of people's involvement in the management of the rural landscape on the city outskirts and the use of nature-based actions in this. On a regional scale, the Gorla water park, a multi-purpose green infrastructure (a series of built wetlands surrounded by a park), offers a variety of valuable ecosystem services. By 2012 the system of regional parks reached 39 % of the land area in the province of Milan. In 2015 the city of Milan had more than 23.5 km2 of public green areas, which can be translated into 17.31 m2 of public green space per inhabitant (Source: City of Milan, 2016). These areas contain 633 recreational spots and 348 areas suitable for dogs. Cento Passi forest represents a unique challenge because its 17 ha were confiscated from the Mafia and ceded to the municipal administration. 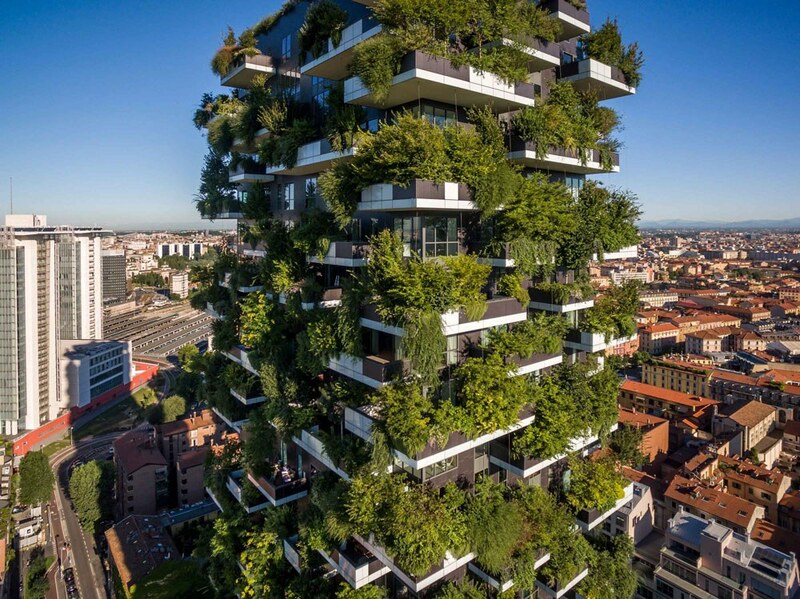 Boeri’s Vertical Forest proved to be a nature-based solution, which could be upscaled and replicated. Nanjing Vertical Forest Nanjing Green Towers, will be the first vertical forest built in Asia. It is currently being developed by Boeri. The facades will have 600 tall trees, 500 medium-sized trees (for a total amount of 1 100 trees from 23 local species) and 2 500 cascading plants and shrubs, covering 6 000 m2. A real vertical forest, helping to regenerate local biodiversity, will absorb 25 tonnes of CO2 each year and produce about 60 kg of oxygen per day (Boeri S., 2017). Mariani L. et al. (2016) have shown that increasing and optimising single components of park structures can improve the cooling effect of urban parks in Milan (See Impacts of EU research and innovation projects in the city). The Lombardy Region, through Regulation ‘D.d.u.o. 22 Dicembre 2016 - n. 13767’, manages a EUR 4 million funding scheme for ‘Infrastrutture verdi a rilevanza ecologica e di incremento della naturalità’ (‘Green infrastructures for ecological connection and ecosystem creation’). Individuals and legal entities — public or private — can apply for a maximum of EUR 30 000 per hectare for initial interventions and EUR 4 000 per hectare per year for maintenance costs, up to a maximum of 3 years. Eligible actions are those involving the creation of green areas whose focus is mainly the development of forest ecosystems, soil restoration and conversion. Financing for the purchase of soil is reserved for public entities (city administrations, parks, regional reserves). In 2007 - 2013 the Lombardy Region invested a total of EUR 61.2 million (Source: Prioritized Action Framework for Natura 2000, 2016). Part of the money (EUR 28 million) came from EU funds (Life+, European Agricultural Fund for Rural Development, European Regional Development Fund) and part from Regional funds (EUR 31.6 million). Private funds are also available. In 2016 the Fondazione Cariplo, a ‘foundation that helps social and civil organisations better serve their own community’, funded a EUR 3.7 million call for proposal to develop large-scale green corridors. The amount funded per project ranged from EUR 450 000 to a maximum of EUR 750 000. The total annual amount for the ordinary maintenance of public green spaces is EUR 17.5 million (EUR 1.01 per m2 per year) while extraordinary maintenance (e.g. replanting or renovation of installations) accounts for about EUR 2.5 million (Source: City of Milan, 2016).